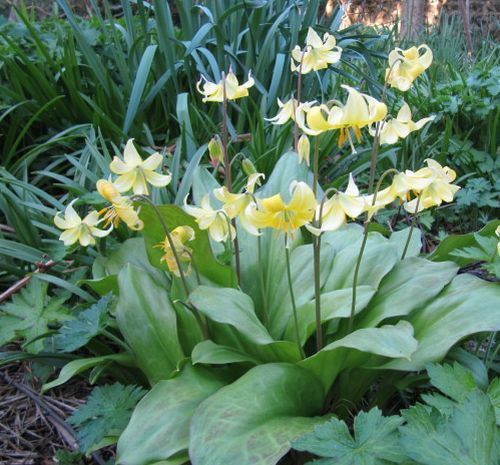 Erythronium are small hardy perennials that reach between 15 and 30 cm in height. They bear small lily-like flowers of white, pink or yellow that flower in the early spring. Their small size makes some species ideal for use in rock gardens. Some common names for Erythronium include Chamise Lily, Dogs tooth lily, Adam and Eve, Adder's tongue, Fawn Lily and Trout Lily. Erythronium grandiflorum by Matt Lavin. 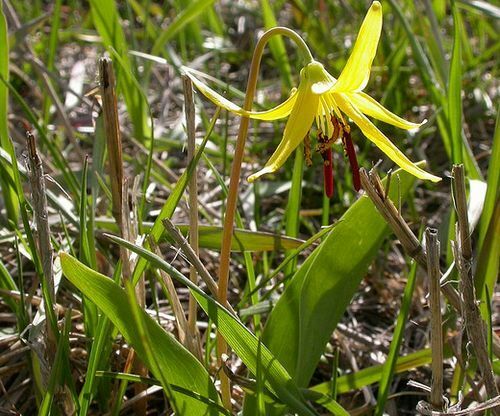 Common Names: Fawn Lily, Trout Lily, Adder’s Tongue, Adam and Eve, Avalanche Lily, Chamise Lily, Dog’s Tooth Violet,. Native: Northern America, Europe, Asia. Flower Details: White, pink, purple, lilac, yellow. Reflexed. Lily-like. Pendant. Foliage: Evergreen. Herbaceous. Lance-shaped to Oval. Wide leaves. Mottled. Corms: 3 to 4 inches (8 to 10 cm). Autumn. Spacing 3 to 6 inches (8 to 15 cm). Seeds: 1/8 inch (3 mm). Germination time: 1 to 18 months. Seed: Method 1: Seeds should first be sown into flats in the autumn. Next sink the flat into the ground in an area that offers shade, preferably close to a wall that faces north. Provide a glass/plastic covering. Keep an eye on the flats to ensure that the soil remains moist. Bring the flats indoors at the beginning of spring and keep at 50 to 60°F (10 to 16°C). Transplant seedlings following the last frost. Seed: Method 2: Sow seeds in a moist growing medium in flats, wrap in a large plastic bag, and then stratify by refrigeration for two to three weeks. Next bury the flat as described above. Once seedlings emerge transplant them to their final location. Requirements and care: Full or partial shade. Moist, woodland-like soil. Regular watering during dry periods to keep soil moist. Late summer top dressing of leaf mold. Keep plants vigorous by diving every three or four years. Propagate: offsets can be planted at the beginning of autumn. Miscellaneous: The species Erythronium japonicum is used to make the Japanese starch katakuriko, which is used to make tempura. Erythronium can be grown from either seeds or corms; if growing from corms then they should be burried about 7 to 10 cm deep in the autumn. Chamise Lilies and other Erythronium like to grow in a shady (partial shady OK too) part of the garden that has a rich moist forest soil. 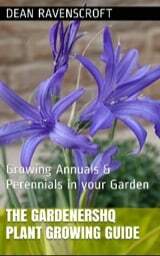 When growing Chamise Lily (and other Erythronium) from seeds, some preparation is required. First the seeds should be sown at a depth of about 3 mm in flats (in the spring). These should then be wrapped in a black bag, then placed in the refrigerator for three weeks. The flats should then be sank into a shady area and covered with glass. Once Chamise Lily seedlings emerge (germination can take anything from one month to one and a half years) they should be transplanted at about 7 to 15 cm apart. Once established it is important to keep the soil nice and moist. Following flowering the plant dies back completely, and should be covered in top soil at the end of summer. To maintain fresh plants they should be divided every four years, this is also a good way of propagating new Chamise Lily plants.